Samsung is planning to start manufacturing its first foldable phone in November 2018 and the device will feature a massive, 7.3-inch OLED display, according to industry sources venting for Korean publication ET News. This latest report, however, gives more substance to a dreamy video from the past: Samsung is now said to begin production of the foldable OLED displays in March this year and build up towards mass manufacturing in September, in preparation for manufacturing of the whole phone in November. The new Samsung foldable phone is rumored to be announced and/or launched in December this year or early next year. 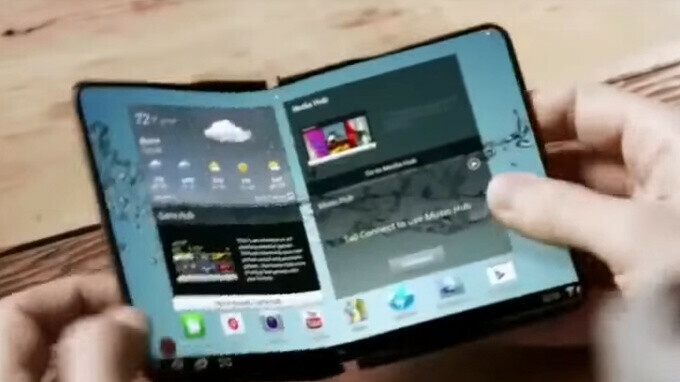 This latest report says the Samsung foldable phone will fold inwards and you will be able to open it much like a book. In general use, it will look like a phone and when you unfold it open it will look like a tablet of sorts. Naturally, Samsung Display is making the screens. Another interesting tid-bit in this report is uncovered plans for Samsung to show this new technology to the industry behind closed doors in September. And in case you wondered, yes, this phone will be expensive, much more expensive than the current 'premium tier' of phones. "The foldable phone is targeting 'super premium', both in terms of performance and price, which goes beyond the existing premium smartphone, and aims to provide the performance, design and usability that is right for the product," an industry source in Korea said. It's too much, in my opinion. I don't believe it's going to sell. But will we have an in screen finger print reader on the note 9?